Also, this is my 400th blog post. Wow, I am so thankful for you for following along on this adventure with me! Finally, in closing, I just want to chat a bit about this link up. I have really been enjoying writing a gratitude post once a week, but I can totally understand it is not something you would write a dedicated post to link up for every Thursday. However, if during the course of writing a post for a week you find that you are thankful or grateful for something (your husband for giving you some time alone in the sewing room, your seam ripper for being so darn handy, a bit of happy mail you received from a swap partner, or a giveaway that you won), be sure to mention it in your post and link up! Am I thankful today ? I’ll tell you when I return from my slimming class . I anticipate I won’t be. However I am thankful I got my two modern quilt ireland bee blocks done . Yours are next ! Congratulations on your 400th post!! I’m thankful to have found you in blog world and am thankful for all the quilty friends I’ve made. Wow, this mini is amazing! That makes for some good eye candy as you iron! Congrats on 400 posts, my goodness that’s a lot of posts! I just hit 100 a couple posts ago (didn’t even notice when it happened!) That’s such a beautiful mini quilt, Renee is absolutely one of those quilters who knocks it out of the park with everything she does. I’ve been very interested in your personal swap. Today, I have to be thankful for every person I’ve ever met, because in a small way, they’ve helped me become who I am. I am working on a proper thankful post, but I think it will take me a few weeks to say it properly. Congrats on the milestone! That is a beauty. You are blessed to have such sweet and talented friends. Both of your minis are absolutely amazing!!! Lucky ladies!!!!! I remember seeing that mini, thinking it was awesome. You are a lucky gal and congrats on the 400th post! Congrats on 400 posts! This week I’m thankful for a hand sewing project I could take anywhere. Wow, what incredible quilting, just beautiful. And I was too late to link up properly this week, but I half linked up anyway! Another thing I thought after previous comments was that even if you don’t get lots of properly ‘thankful’ link ups, you do still get lots of comments usually where people are thinking about things for which they are thankful. So maybe not quite as successful as ideally you’d like yet from a linking point of view, but if you measure your success more by how you’re making people think more about the good things in their life for the week – pretty good measure of success I’d say – then it does look much more successful. Yvonne, I saw Renee’s post with this quilt and knew you must have been so thrilled over your new quilt. 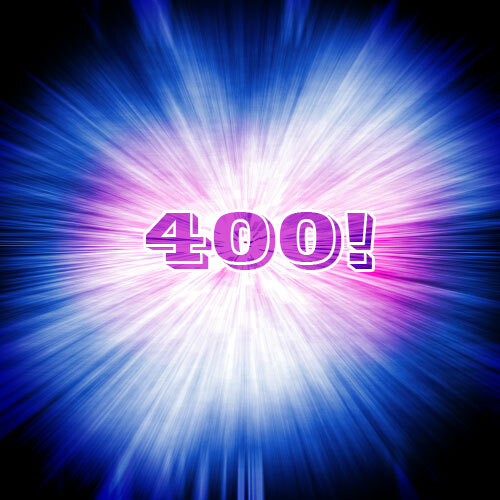 Congratulations on your 400th post… that is quite an accomplishment! Your Quilty Thankful Thursday has made me more aware of expressing gratitude in my posts, even when I don’t have a new one to add to your linky. I hope to participate more often too! The fun in swaps is not the comparisons (her sewing is better than mine and mine will not be nice enough) but the difference – the pleasure in receiving something out of your own style, made by another crafty pair of hands, and in trying to adjust your own style to suit the other’s tastes. I think you and Renee are both talented.